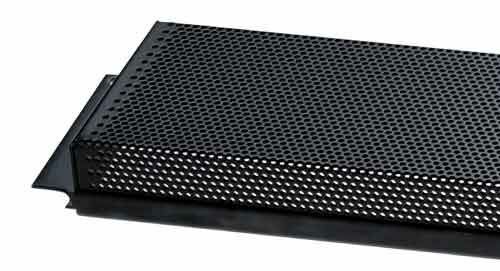 More on the Chief Raxxess Perforated Steel Security Cover PSC below. Chief Raxxess' PSC-series component covers provide additional security for rack-mounted equipment by preventing unauthorized removal and tampering. Single-piece, 16-gauge steel construction without any welding on the ears. 1/16" perforations for maximum concealment and uncompromised airflow to heat-generating electronics. An expanded, 1" offset, allowing room for all dials/knobs. Neoprene gasket edges to prevent scratching. Integrated screw notches, allowing you to remove the cover without removing the gear. A baked, black enamel finish. *Choose between 1, 2 and 3-space units. Also available with larger, 5/32" perforations. See model number SEC, in the "Related Products" section below.